If you didn’t join us in October, you missed a great meeting. Our Blogging 101 panel covered top blogging tips to help us stand out online and in social media. From newbies to pros, everyone left with a few actionable steps for their blogs. Heather built her blog, Local Mom Scoop, as a destination website for South Florida parents and now gets calls from brands as an influencer and brand ambassador. In an inspiring talk, Heather shared how she grew her site by reaching out to local businesses. Also, build your blogger tribe. Get a bunch of blogger friends you can call to bounce ideas off of or get input. We’re all here for each other. Holli uses her experience as a registered dietitian nutritionist and her skills in photography to run her food and drink blog, The South Florida Sage. She offered photography tips that have helped her stand out. When setting up Instagram, realize that the way it’s set up is part of your branding. You may want to pick a theme, 3 or 4 colors that match your brand or pastels, for example. Her recommended tools and apps: the Pocket Spotlight from Photojojo for an extra spotlight when you don’t want to use flash on your phone camera, VSCO photo editing app and the Over app to watermark images. As the vice president of public relations at Kip Hunter Marketing, Aimee has worked with many bloggers. She shared what her firm looks for when considering bloggers for her clients. She checks web stats when vetting bloggers, as well as social engagement, such as how many likes, comments, and shares they receive. Tools like Siteworth Traffic, Quantcast, and Compete help her check web traffic. She also uses Vocus (now Cision) a PR tool and media database. She encourages bloggers to submit their information if they want to get contacted by PR firms. She works with bloggers to help them with story ideas and also tends to share their blog posts through the client’s social accounts as a thank you. Aimee also reminds everyone to spell check and proofread before publishing. A tool like Grammarly can help. As an influencer and consultant, Evan uses social media, live streaming, and community building to support his #Choose954 movement and others. Since his days with AT&T and Verizon, he’s seen the rise of many trends in technology and looks forward to what’s coming next. Be strategic. Use tools and resources to help you. He recommends IFTTT.com to sync accounts, share messages and save time. His networking tip is to “network up” or network strategically. Try to get introductions to people you really want to meet. A former TV anchor and reporter, Christina owns a PR firm and blogs about business on Media Maven and lifestyle on Mascara Maven. Christina moderated the panel and offered a few tips as well. Try to add video content to set your site apart. Using Facebook Live will show your content to more people. Pick your niche and niche down with your blog. Also, pick colors, fonts, etc. and choose the way you want your brand to look. Networking is important. Remember, we usually get most of our business from referrals. Thank you to all of the speakers for a great panel. 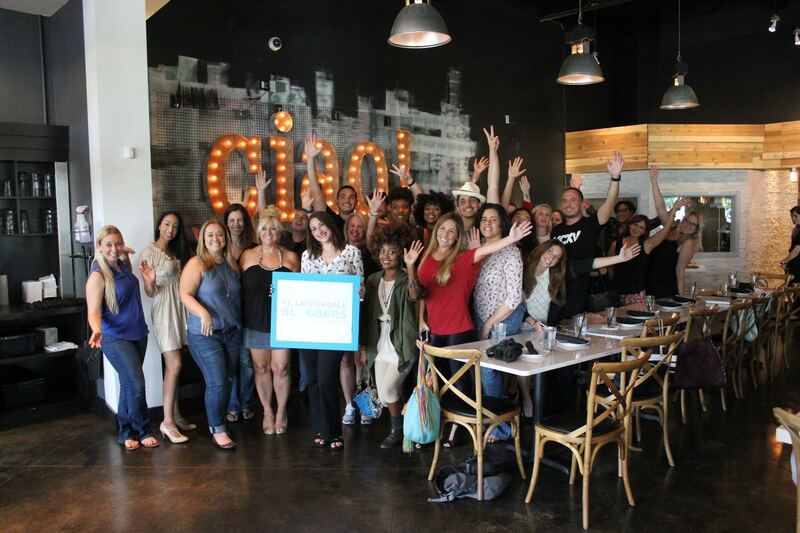 A big thank you as well to Ciao Cucina Bar in Coconut Creek for hosting us and for the wonderful food!